A Dictionary of Japanese Food by Richard Hosking describes O-hagi as an "inside-out rice cake, so called because the an normally inside the cake is on the outside. The cake is named after hagi (bush clover), which flowers in the autumn and which the cake vaguely resembles. 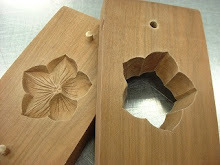 When these cakes are made in spring, they are called Botan mochi (peony cakes). They are made with a mixture of glutinous and non-glutinous rice and are coated with tsubuan... Simple, very popular, and very good." I often think of Ohagi as an inside-out daifuku, which I guess is what Hosking means by "rice cake.". I introduced daifuku in my blog on Ichigo-Daifuku (Strawberry Daifuku), in which a fresh strawberry and red bean an were wrapped in mochi. An is a paste that can be made from various starchy ingredients and sugar, but the most common ingredient is azuki beans, which are reddish. Red bean an comes in various degrees of coarseness. 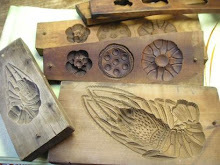 The tsubu-an mentioned in the quote above is a coarse an which includes pieces of the bean skin. Koshi-an is smooth an where the skins have been sieved out. Shiro-an is made from white kidney beans. An can also be made from sweet potatoes, chestnuts, and lily roots, among other things. 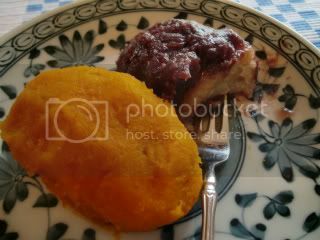 Today I made kabocha (Japanese pumpkin) an to slather over my ohagi. I use a short-cut method to make the mochi center, by following the directions in the aforementioned Strawberry Daifuku blog. You may, of course, prepare a mixture of glutinous mochi rice and non-glutinous rice from scratch, but you won't find directions here for that (sorry). To make the pumpkin an, I cut up a Japanese pumpkin (kabocha) and cooked it in my microwave until it was soft. I scraped the orange flesh off the tough green outer peel, and mashed it with a fork. Use a food processor if you like. Kabocha are naturally sweet, but if you want it sweeter-- or if you use a pumpkin that isn't quite as sweet-- add sugar to taste as you mash it. Make oblong rolls of mochi (made sufficiently soft by following the directions in the daifuku blog) and coat with with the pumpkin an. I made a few of the traditional ohagi covered in coarse red bean an, a few with the pumpkin an, and placed one of each on a dish for contrast.